“Ang Pagbabalik sa Tawitawi” documents Ligaya Amilbangsa’s return to the Sulu Archipelago after more than 30 years, to re-connect and to share with the people whose arts and culture she helped to preserve. The film centers on how Amilbangsa researched and documented pangalay, also known as igal and paunjalay in the Sulu Archipelgao. The art of the Sulu Archipelago (Samal, Bajau, Tausug, Jama Mapun), particularly the performing arts and the visual arts, are the Philippine’s living links to the culture of the rest of Asia. At present, collective memory of the music, dances and visual arts is being lost at an alarming rate due to western acculturation, globalization, disinterest in tradition, armed conflict, and many other factors that the documentary will tackle. Fortunately, such vanishing arts and culture of the Sulu Archipelago have been documented by Ligaya Fernando-Amilbangsa, a Christian who fell in love with a Muslim closely related to the Sultanate of Sulu. In 1964, against her mother’s wishes, Ligaya married Datu Punjungan Amilbangsa, the younger brother of Sultan Mohammad Amirul Ombra Amilbangsa—the last reigning sultan of Sulu. As fate would have it, the marriage became the fulfillment of Ligaya Amilbangsa’s life mission. By living in Sulu Archipelago for over three decades, she was able to record the performing arts, visual arts, and other traditions that are now endangered intangible cultural heritage. 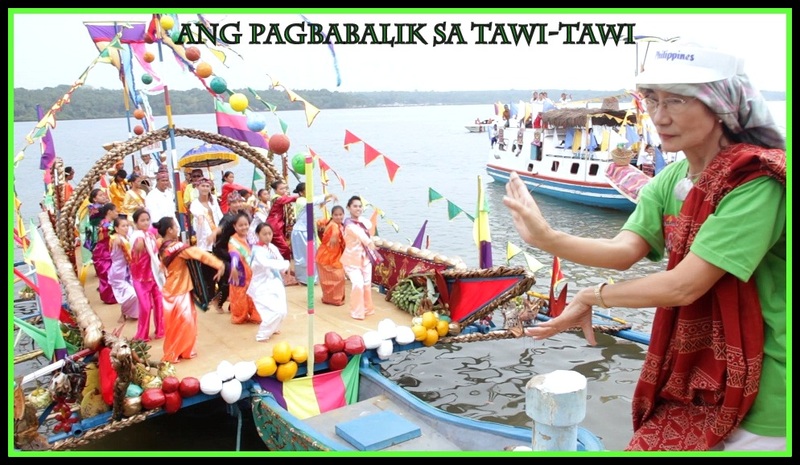 “Pagbabalik sa Tawi-Tawi” was filmed in a period of three years from 2011 to 2013. The film is written and directed by Nannette Matilac, with support from LotusBlaze Projects, NCCA, Ateneo de Manila University, Museo Pambata, the Provincial Government of Tawi-Tawi, Mahardika Institute of Technology, with the efforts and financial assistance of many cultural workers who believe in the film project. The film showings will be followed by dance demonstrations and lecture-discussions. Is the film Ang Pagbabalik sa Tawi-Tawi available on DVD or some other format that I can order for purchase? I’m in the U.S. I know Grace Amilbangsa and I found out about this film through her FB post. I do hope this will be available soon. If this film is now out on DVDS, I too would be very interested in purchasing a copy. Also, I sincerely hope this website and this movement stays active.